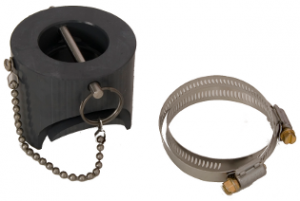 Midwest Instruments - Pipe Adapters for our paddle wheel flow meters. Pipe Adapters mount the flow meter to pipes of various sizes and schedules. Specific to each pipe size and schedule, an adapter for a 3″ schedule 40 pipe will not work on a 3″ schedule 80 pipe. The user can program the Pipe Mounted Meters or the Remote Display Flow Meters for any of these adapters. We supply all of our meters with an adapter. The same meter head can be moved to different locations by purchase additional adapters and plugs. Most difficulties with all flow meters are traceable to improper mountings and/or improper pipe sizing. Paddle wheel flow meters rely on the momentum or movement of water to spin the paddle and keep it free of debris, biological growth, sediment and air bubbles. Reduced accuracy and fouling problems are typical when pipes are over sized and flow rates are not within the recommend range. Pipes must remain full of water at all flow rates. This is especially critical when monitoring downward flows on vertical runs. Please read this page for selection and mounting location advice. This system offers the simplest installation procedure and is cost effective for pipes 4” in diameter and smaller. 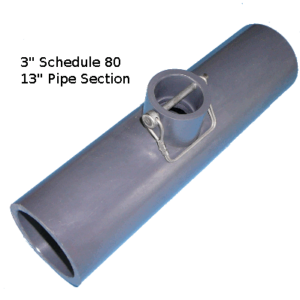 These 13” pipe sections are available in sizes ranging from ½” to 4”. The smaller sizes are only offered in schedule 80. Schedule 40 and 80 pipe have the same outside dimensions. Therefore our schedule 80 section of pipe will glue up to your existing schedule 40 pipe. Installation consists of removing a section of the existing pipe, coupling in this new section of pipe, allowing the glue to dry and restoring the flow. These are saddle mounted adapters that are specifically machined to your pipe dimensions. A pipe with a smooth outer surface is required. In order to machine the adapters, the outside diameter and wall thickness of the pipe will be required. The adapters look and mount the same as the saddle style depicted above. The accuracy of the meter is greatly affected by the depth the paddle wheel is inserted in the flow. Therefore, wall thickness of the pipe must be accurate to within 0.010”. You need to call (715-523-1268) to have these custom machined. PVC plugs allow the meter to be removed for cleaning or servicing The same plug fits all pipe adapters.